In this thread, we talk about the easiest superstitious beliefs to debunk/explain without having to actually study them case by case and run experiments. Here's one: The "picture frame with following eyes"
As pointed out once by another forum member whose name I don't remember: It takes only one word to explain why people being really convinced that they're going to obtain something is not only not guaranteed to give them the thing, but most of the times it won't: Casinos. Most people who are there, despite their conviction/desire to obtain what they want, lose. It seems, for me, the easiest to debunk someone's nonsense is to expose them to sensible communication. People like to cherry-pic random bits and pieces of what supports their stance. When you ask them their about their sources of information, it is always be, "I read it somewhere", "a friend told me . . ." If the person asking the question is prepared, it is easy to back up your knowledge. I sort of think the Ouija Board wouldn't survive anyone pointed out that it was literally invented as a parlor game* in 1890 and is copyrighted and owned by Parker Brothers (well I think now Mattel) which literally makes it as supernatural and ancient as Sorry! and Candyland. It's like starting a religion around Settlers of Cataan or Cards Against Humanity. *Okay before anyone "Well askchsually..."'s me, yes precursors and the vague concept of "automatic writing" did exist but the actual Ouija Board with the planchette and the 1-9, and the Yes/No, and the Letters was invented, yes invented, by businessman and inventor Elijah Jefferson Bond in 1890. I mean literally check out the dude's tombstone, it's hilarious. It wasn't until WWI that an American spiritualist named Pearl Curran basically retconned it into an actual "mystical tool" that could "Communicate with the dead." Last edited by JoeMorgue; 4th April 2019 at 07:49 AM. Astrology you can pretty much throw out the windows with basic math. If where the planet Neptune is at in the sky has an effect on my mood or personality, a plane flying overhead would have magnitudes more just by basic physics. Round earth. Easy to disprove. All the flat earthers have to do is mount an expedition to 4 roughly equidistant points around the so-called equator. I suggest Singapore, Gabon, Ecuador and Kiribati. At each location, the team mark the shadow the sun casts of the top of a flagpole, lamppost or similar every hour as it rises (which round-earthers claim will be due East of them) climbs directly overhead then sets (supposedly due West) just to see whether it really moves in a straight line without deviating or in fact curves. They can phone each other regularly to check that everyone's results agree where they overlap (for example as the sun sets in Singapore it ought to be overhead in Gabon, and just rising in Ecuador). The sun should constantly be visible from at least two positions. If they get the results round-earthers expect then they will have shown that the sun continuously moved in a straight line across the sky, yet after 24 hours had returned to where it started. This is clearly impossible, so they must maintain the utmost vigilance in order to spot the moment when the sun changes direction in order to jump back to the starting point. There's a great SNL sketch on this involving Oprah and the author of the secret trying to tell a Sudanese villager that is problems really are just due to his negative feelings. Does anyone other than fundie christians think OUIJA boards are anything but a parlor game? The effects of the planets on people's behaviour and on their fortunes was so obvious thousands of years ago that our ancestors were able to make a comprehensive list of their influences. Yet we can't even detect them now. I wonder what changed. It's not the belief, it's the believer. Any woo is easy to explain or debunk, if the person you're talking to is willing to listen to what you have to say and consider that they might be wrong. With respect to Jack by the hedge, I think that because the flat earth is so easy to disprove, that makes it paradoxically very difficult to debunk. You're not dealing with someone who sincerely holds a misguided belief through ignorance. You're dealing with a troll who's adopted a pose. It goes back to the problem of the believer. You're not trying to convert someone who believes in a flat earth. You're trying to convert someone who believes that it's fun to pose as a flat-earther and watch your debunking antics while they maintain their pose. I think this is actually a problem for a lot of debunkers. There's this cargo-cult sense of "if I just show the geometry, they'll give up their woo!" But that's not how belief works, and it's not how people work. I think that a lot of people are attracted to the skeptical pose because they think it means they get to be right without having to bother with being humane. Last edited by theprestige; 4th April 2019 at 08:32 AM. I think it's even deeper then that. It's not even trolling sometimes, it's more of a sincerely held belief in anti-intellectualism. There is an angle of "I'm just trying to show you that being factually correct about everything isn't that big of a deal" to at least some of this. It's unspoken, it's ill-defined, hell probably often to the people who hold it, but I do think with a lot of Woo the... moral I guess (probably not exactly the right word but close) we're supposed to be taking away from it is less "I'm trying to convince you that this is actually literally true" and more a vaguer "I'm trying to show you that I hold this patently false belief, I'm not going to work to get rid of it, and I still manage to get by." I do think at least some of this comes from people who, on some level either conscious or unconscious, see skepticism as "having to be right all the time" and are pushing back against that image of it by being wrong for affect basically. ETA: Basically I think a lot of Woo has nothing do with actually believing the Woo on any practical level. It's about the idea that "skeptics" are just this bunch of joyless busybodies spending their time ruining things for everybody else and a lot of Woo is just showy "Lookit me. I'm believing in this dumb thing and I'm still happy and functioning." Last edited by JoeMorgue; 4th April 2019 at 09:06 AM. I will admit, I can't get through a description of homeopathy without laughing. Seriously, how much more stupid could you get? Then again, the guy that invented Scientology was the one who boasted that he could completely make up a religion and get people to fall for it, and that's what he did. He's like the magician who tells you, "This isn't magic, it is an illusion" and people still insist that he is doing magic. With respect to Jack by the hedge, I think that because the flat earth is so easy to disprove, that makes it paradoxically very difficult to debunk. You're not dealing with someone who sincerely holds a misguided belief through ignorance. You're dealing with a troll who's adopted a pose. None taken, as they say. Yes, that was pretty much my point: if flat earthers were serious there's plenty they could do to show if they were right. It's not about being right, it's about being contrarian and the sport of batting away objections. I would think anyone who's ever made a cup of tea could see right there that homeopathy is nonsense. Bah! That argument is weak tea! It's not that simple. For a start it only works if the subject was looking directly at the painter's face, otherwise the eyes won't follow you at all. Second, it's some real image processing in the brain that actually tells you that, not just the fact that you can see the eyes. The thing is, we actually evolved to track the exact direction someone's eyes point. Presumably because it was really important back when some tiger could pounce you on very short notice. And not just we. Your dog can also tell if you're looking directly into its eyes or a bit left or right or above. The evolutionary importance of it goes waaaahahaay back. And it's really accurate. From the back of a college lecture hall, you can actually tell whether the professor is looking at you or the guy next to you. The difference is, what, one or two degrees? But you can tell that. And it's not just the fact that you can see the professor's eyes, since you can see them just as well in both cases. In the case of a 2D picture, essentially you see what the painter saw, even if you move around a bit. If that guy was looking straight at the painter or the camera, yep, your brain tells you that he's looking at you. But in any case, it seems to me like if you want to "debunk" it, it helps if you know WTH you're talking about. Going into your own equal and opposite woo, like that "you lock eyes", is not very helpful. Not the least because the only reason some pictures seem special is that the majority of pictures don't seem to follow you at all. That's what makes those that do that stand out. To use a well known painting as an example, in Leonardo's Last Supper there are 13 people in the scene, and exactly NONE seem to track you with their eyes. So asserting to people that all pictures do that is just gonna sound like you're the one making up some woowoo, and rightfully so. Last edited by HansMustermann; 5th April 2019 at 07:29 AM. Bond did not invent the talking board with the planchette. It is questionable whether he or Kennard or Reiche invented the actual Ouija board. But the Ouija was taken directly from talking boards used by Spiritualists. Spiritualism became popular in the 1850s after the popularity of the Fox sisters. They used taps and knocks to indicate communications from the spirit world. That led to similar parlor activities. People would ask the spirits questions and knocks would identify the answers. To get more specific answers, spiritualists would call out letters and a knock would indicate to write the letter down. By that means the spirits could call out a written message. They did similar things with letters written on slips of paper or tiles or cards. The problem with this method was that it was painfully slow. That gave rise to talking boards and the planchette. There were talking boards in the 1850s and 1860s that used a board with letters and numbers and used a variety of mechanisms or dials to mysteriously select the numbers and letters to spell out messages from the spirits. But it was the planchette that became really popular in the 1860s. The planchette was a small table with three legs similar to that used for Oujia but with a hole to insert a pen or pencil. People would move around the planchette to write out messages from the spirits. Planchettes were originally sold in bookstores and stationary stores due to their association with writing. Milton Bradley popularized board games in the 1860s. The toys and games industry largely took over the market for planchettes. The Spiritualist movement died down in the 1870s, but was revived in the 1880s. The planchette with its messy writing was replaced by the talking board. Tuttle sold the Psychograph in Ohio, which was a dial that two people would put their hands on and would select letter, numbers, yes, no and good bye. Using a table with painted letters and a planchette was attested to as early as 1876 in American Spiritual Magazine. These types of talking boards became popular with Spiritualists in Ohio in the 1880s. In 1886, the Associated Press released an article on the use of talking boards by the Spiritualists in Ohio. This article received wide attention, including the attention of Kennard. Kennard started a company with Maupin and others to make a talking board. It was Maupin’s friend, Bond, who was named as the inventor for the patent, which was assigned to Maupin and Kennard. The Ouija board was marketed as “mysterious” but they intentionally did not describe how It worked. They didn’t say that it was messages from the dead or some other spirit or some other type of divination. Kennard and his associates were not Spiritualists trying to push some Spiritualist idea. They were businessmen trying to make money. By leaving it vague, it made the board more mysterious and allowed people to project their own thought and ideas onto the board. Although the Ouija board, and other talking boards and planchettes, became products of the games industry, it has its roots in Spiritualism. It is more akin to a manufacturer of card games production a deck of Tarot cards. The point about pictures with eyes looking at you is that if the picture is painted looking at the painter, there is no position where it will not look as if the eyes are looking at the spectator. Conversely, if the eyes are painted looking away, there will be no position where the eyes will look at you. I think that the reason why some pictures stand out with following eyes, is that some painters were more accurate in painting this. Our biological ability to see when we are being looked at, is thrown completely off kilter when we encounter a cross-eyed person. That is probably why we feel so uncomfortable in this situation. Energy orbs or spirit orbs or ghost orbs or whatever in photos. Nope. It's just out of focus dust or something else in the air, usually illuminated by the camera flash. Breathtakingly easy to debunk and demonstrate, but people still believe it and post their pictures of spirit orbs all the time. Sure, the debunkers explanation might explain most of the orb photos, but it doesn't explain their photo. Because they're special. Reflexology. Why doesn't half of somebody's body literally stop working when they have a foot amputated? It's not really about debunking anything, IMO. You can spend all day offering reasonable information about why something very likely doesn't exist, but if the person you're offering this information to is set in his or her beliefs, then you've basically spent all of that time kicking a brick wall for no good reason. Most avenues of woo are pretty straightforward things to debunk, but the people who need it to be debunked aren't interested. That's all fair enough, and thank you for contributing with more knowledge and background information to expand on that one.... But I just wanna state for the fact that the bolded is a strawman. I never said that this applies to all paintings. A better pointed question to ask is: why do easily discredited beliefs persist? That question has been tackled by Shermer in his book titled something like : why do people believe weird things. James Randi did thousands of Dowsing tests over the years and never even once found a case of real Dowsing. 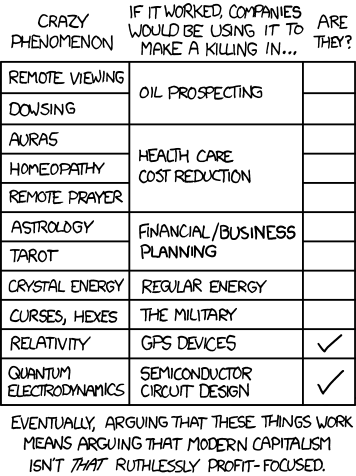 The XKCD sums it all up well for me. Almost all woo, if true, would have some company making millions of dollar of it. Not of all selling to stupid people, but off of it. "xkcd is licensed under a Creative Commons Attribution-NonCommercial 2.5 License. Hotlinking specifically permitted by website owner/operate." The worst case of this was a company trying to pass of Dowsing Rods as mine/explosive detectors to the various allied militaries during the height of the Iraq/Afghanistan conflicts. I have hanging on my wall a print of Frans Hals' Laughing Cavalier, which clearly demonstrates this principle. It was a wedding gift to my grandparents, and when they passed away it came to me, since I had admired it all my life. Flat Earth can be debunked using a multi-storied house with a view towards the east or west horizon. By far the easiest is large, terrestrial cryptozoological creatures. I seem to recall Uri Geller claiming that various corporations had paid him huge sums of money to find oil, mineral deposits, etc. using his "powers". ...And it's really accurate. From the back of a college lecture hall, you can actually tell whether the professor is looking at you or the guy next to you. The difference is, what, one or two degrees? But you can tell that. And it's not just the fact that you can see the professor's eyes, since you can see them just as well in both cases. I disagree, depending on the size of the lecture hall, of course. I would like to see this put to the test. I don't think we could tell the difference of a few millimeters at a distance over 10 or 20 feet. And of course, how many times have we waved back at someone only to find out they were waving and looking at someone else? Somewhat related is the fact we don't really look into someone's 'eyes', we can only focus on one eye at a time. I've noticed it mostly in Soap Operas, but it occurs in other movies and tv shows: when talking face to face, one of the actors eyes will dart back and forth between the other's. I actually just testing with a coworker and he was able to tell on which eye I focused. I would assume that would only work at short distances (we were probably 4 feet apart). At some point I suppose I wouldn't focus on just one eye, but on the entire face maybe. Speaking of which, how did painters handle this? Is the focus of the subject's gaze painted towards one eye? This wouldn't be the case with photography and motion pictures. Since the subject is looking at a single lens, to an observer, the focus would be directly between the eyes. I think most good painters simply understood that you tell your models to look a bit to the side and/or up or down. Not the least because we look better from a bit to the side. As I was saying, when you look at the last supper, Leonardo managed to paint 13 people in that scene without any of them looking directly at you. The Laughing Cavalier's face is turned slightly to one side, but his eyes are fixed on the viewer. Well, that is why I've phrased it as "look a bit to the side" and not "have the head turned a bit to the side." As you've correctly noted, we can figure out the direction the pupils point at, even if the head is turned a bit. And his face is eerily reminiscent of someone's avatar. But you also know how they convince themselves that they are right: They didn't desire/want it enough and their conviction/faith faltered. julian assange was arrested at just the right time. I'd say popular dead musicians being still alive- Elvis or Tupac. That's nuts. I don't think there's any woo that's easy to debunk because no matter how ridiculous it is or how trivially easy it is to show false, there are people who fight very hard to keep the bunk on. This morning, I popped open a can of Coke Zero Sugar in the breakroom. One of my coworkers told me, "Why are you drinking a soda in the morning? That's bad for you!" I questioned her about why she thought it was bad and she said it was because of the sugar. I pointed out that there was no sugar in Coke Zero Sugar. She said "well, the artificial stuff is bad too. That's probably why you had a heart attack!" I asked her if there was something especially bad about the morning and soda and she replied that , indeed there was -the only thing people should drink in the morning is juice and water. I pointed out that juice has a lot of sugar. She seemed mystified for a moment, then shot back, "But the sugar in juice is natural. You are drinking artificial sugar." I replied, "What if I drank a soda with pure cane sugar, would that be better?" She replied, "No! Soda in the morning is bad!" I said, "OK, so soda in the morning isn't bad because of the sugar then? Is it the carbonation that's bad in the morning?" She just rolled her eyes and said, "You don't get it." You just can't disabuse people of really dumb ideas that they strongly believe in, no matter how trivially false or not-well-thought-out those ideas are. She will likely think that diet soda in the morning is bad and continue to guzzle down sugary juices well after her first diabetic coma . . .
Another soda related one: When my kids were in school, one of their classmates did a Science Fair project where they soaked a chicken bone in Coke. The effect was, of course, that the bone began to dissolve. They used this obvious effect to conclude that drinking soda will cause your bones to dissolve. I pointed out to the kid and the parent that they should instead say that it can cause tooth enamel to erode by the same kind of process that dissolves the chicken bone. They vehemently disagreed with me -soda would cause your actual bones to dissolve like the chicken bone. I pointed out that bones never come into actual contact with the soda acids and that the stomach produces hydrochloric acid which is a bit stronger than the acids in soda. But no. They were convinced that their little project proved that sodas dissolved skeletal bone. And the kid got a ribbon at the Science Fair so I guess they showed me. I drink a fair bit of soda as the water here in Mexico is a bad weight loss program for me. A guy holding a cheap beer and cig will tell me soda causes gastric damage. Which maybe it does. Point at his beer and he says that is natural without sugar. Say dehydration is also bad and he suggests bottled water which costs more and tasted like ugh. Many times it isn't very purified and still causes problems. Pure gov propaganda these people believe without knowing booze isn't good either and gringos can't drink tapwater in Mexico. But they put lots of wonderful sugar and caffeine in sodas and sell it cheap so they got that right. Fake sweetener sodas are horrible tasting swill.